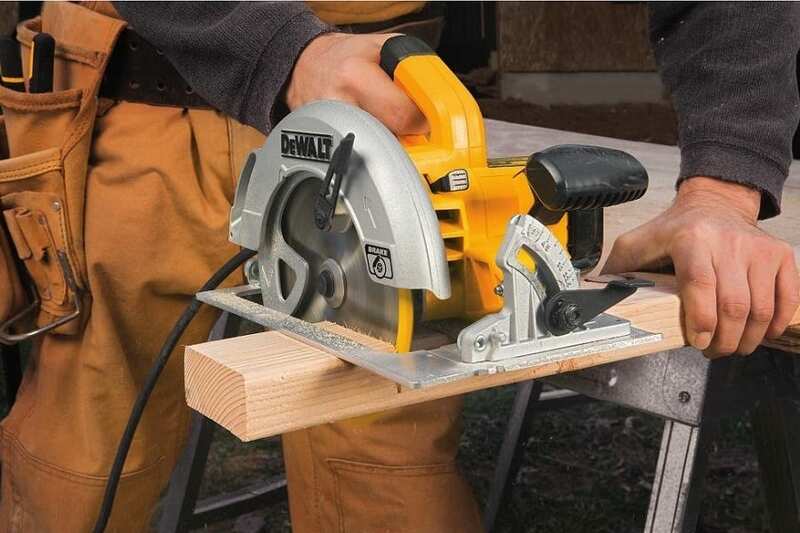 A portable lightweight saw that is great for many woodworking projects. It comes with electric brake for added safety. If you are even remotely interested in DIY projects or you are running your home repairs by yourself, then you have heard about DEWALT. Dewalt is American powerhouse when it comes to power tools. 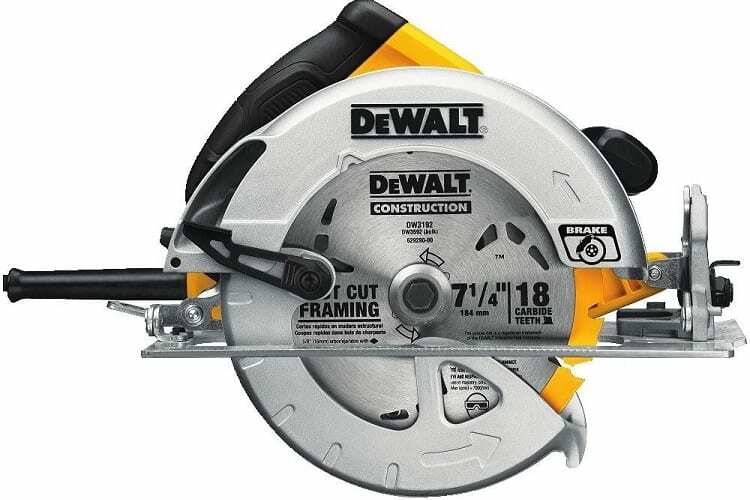 And as you will see in our review of DEWALT DWE575SB 7-1/4-Inch Lightweight Circular Saw, power is their determinant when it comes to quality of their products. In this review, we will dive deep into features of this circular saw and find out is it perfect match for your next woodworking project. At just under 9lbs, this circular saw is among the lightest saws in its class. The first thing that is worth mentioning is an actual bag that comes with this circular saw. It is made of durable materials (canvas) and will serve you for years to come. Some people are fans of plastic cases for tools, but it can become a hassle when you have multiple tools, so this "doctor style" bag is a perfect match for this particular saw. There is also a blade cradle that will hold up to 5 saw blades. Spring clip retainer will make sure that your blades are securely in the cradle. This machine is powered by 15 amp motor that will help you cut even through the toughest material. There are even videos where this saw goes through African blackwood planks which is one of the toughest wood types out there. It provides 5,100 revolutions per minute which will ensure that you cut through almost everything. DEWALT DWE575B parts allow its user whooping beveling capacity of 57°. With stops at 45° and 22.5°, this saw will enable even beginner users confidence in their next woodworking project. Many beginners are repulsive when it comes to circular saws, most have concerns about safety and it's not surprising because the accidents can happen. This is where DEWALT DWE575SB shine, with the built-in electric brake as the most important safety feature it provides a user with insurance that when things go south, the electrical brake will stop the saw. On top of that electric brake saves your time.If you are used to working with the circular saw that doesn't have an electric brake, you will need some adjustment period to get accustomed to the fact that pulling your finger off trigger caused your saw to stop. You will also get DEWALT DWE572 manual with detailed instruction on how to replace blades, disassemble saw and much more. On top of that DEWALT provides 3 year warranty on this circular saw. 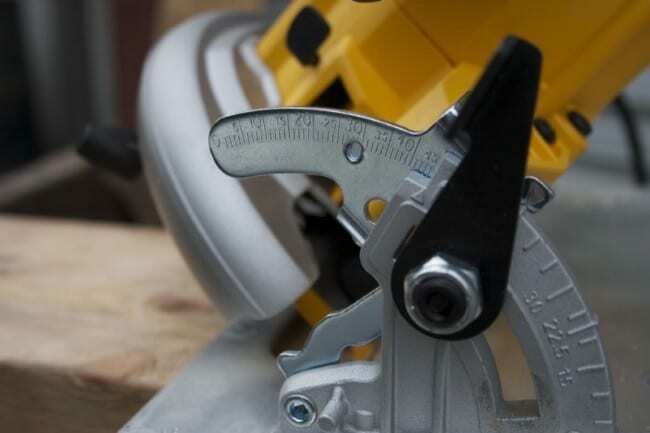 Depth cut is another key feature of this great circular saw. Max depth of cut at 90 degrees is 2.5 inches and at 45 degrees it is 1.9 inches. As this is 7.25 inches blade diameter circular saw a depth of cut is bigger than on 6.5 inches version. There is a huge chance that your neighbor have this saw for his woodworking projects and that' no wonder. DEWALT DWE572 is a best selling circular saw for few last years. It is powerful but also easy to handle and thus perfect for beginners. It is also low weight so you can cut with it for prolonged periods of time. This saw comes with a carbide tipped saw blade intended for long life and efficient cutting. Bevel angle adjustment and bevel detent are pretty straightforward and really you will only need a brief look at this bad boy to understand how to adjust your cutting angles. It is also equipped with kerf and cut length indicators (increments are 1/8 of an inch). This circular saw is the main one in my workshop. Cutting and even ripping are piece of cake even for beginners. If you follow safety precautions as with every power tool in your "arsenal" then you shouldn't have any problem with this saw. As with any tool that we review, this one also has some drawbacks. There can be some kickbacks when working with this circular saw. This mostly occur when the saw blade becomes pinched or twisted in the cut. This is easily solved with proper workpiece support. Avoid cutting overhanging or cantilever material or cutting of narrow strips of material. As we mentioned before this saw comes with a plethora of extra feature, but sadly rip fence is not among them. So it is another minus for this circular saw.